Define the term 360-degree view. List ways to boost the quality of your data in Salesforce. By now, you’ve probably heard the term 360-degree view—too many times in fact. But do you know what it really means and why it’s so important to your business? Mathematically, 360-degrees refers to a full circle. In the physical world, a 360-degree view is the ability to see everything around you with no blind spots. When you apply it to your customers, a 360-degree view is a complete view of who they are, where you can see every single angle of their relationship with your company. 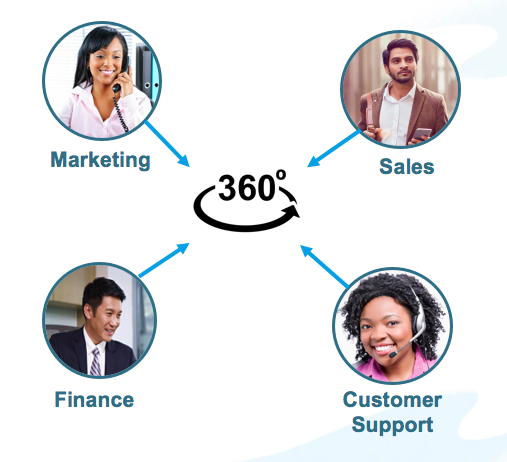 What makes up a 360-degree view of a customer? It probably includes a history of every interaction they’ve had with your company—everything they told you during the sales cycle, every time they’ve called in for service, what marketing campaigns they’ve seen or ebooks they’ve downloaded, and even what events they’ve attended. It also includes information about who they are—details about their business, what businesses they’re related to, who has the buying power, and things like what technologies they use or the subindustry they’re a part of. It’s your customer’s story, from beginning to end. Having accurate customer information has a multitude of benefits. And there are pretty compelling arguments as to why your sales reps are advised to track their customer interactions. It lets sales managers and executives get a view of all the deals in aggregate, meaning accurate forecasts and a chance to see which deals might slip. You have what’s referred to as institutional memory. If there’s rep turnover, the information on their accounts lives on for someone else in the company to reference and use to continue the relationship seamlessly, with less likelihood of customer churn. Business decisions—from staffing to territories—are informed by data. Good, clean data leads to good decisions. It helps them keep track of everything about their customers, so the burden is off of them to remember every single conversation and all those facts about their customers’ kids. It builds that gorgeous 360-degree view that helps them personalize their interactions with each customer to help find the perfect solution. All that customer data and information about the deal is stored in one place, so if your reps need to bring in a selling team, everyone can quickly get up to speed. It saves them loads of time! When sales reps get bad customer data, they can be left contacting an account that’s out of business, or maybe one that’s already a customer. How embarrassing! Those golden nuggets of customer data come from all over the company, but unfortunately, they’re often stored in many different systems. You get a crisper view of your customer’s journey if all that information (from sales, service, and marketing) is stored in a single place that all teams can access at any time. We can help you integrate all these systems onto one secure platform so reps can have a 360-degree view that helps them create amazing customer experiences. Sales reps are a goldmine of customer information, and it’s crucial that they store that data in Salesforce. While it sounds like extra work to ask reps to enter information into a system like Salesforce, the effort can have big returns. Here are a few ways you can motivate your reps to get started today. Make it easy: Salesforce has tools that capture the information for your reps, like Einstein Activity Capture and Salesforce Inbox. Reps don’t have to manually enter anything; these products note the information and store it with the right customer and opportunity. Pretty slick, right? Make it a cultural norm: One customer told us that their VP of sales began using exclusively Salesforce reports in all his forecasting meetings. It didn’t take long before all the sales managers and then all the sales reps starting using it. Make it required: You can lead by example (see above), but sometimes you want to also make it mandatory. At Salesforce, we live by the mantra, “If it’s not in Salesforce, it doesn’t exist.” In other words, if a sales rep hasn’t entered an estimate for an opportunity in Salesforce, their managers don’t consider it part of the forecast. If reps don’t put a closed deal in Salesforce, they don’t get paid commission. Anything not officially entered didn’t happen. Firmographic data is the firm data about how many employees are at the company, where headquarters is located, and what industry the company is a part of. It’s super important information, but is it super important that the reps themselves enter that data? Not necessarily. We know how busy sales reps are, so consider this: Use a third-party data source that can gather information for reps. Peruse Lightning Data in the Salesforce AppExchange program for data vendors. Once you pick a vendor, it’s easy to quickly integrate it with Salesforce and automatically enrich and update customer data in Sales Cloud. Combine the firmographic data with the info from around the company, plus your sales reps’ interactions with the customer, and get a breathtaking 360-degree view.